Strong admiration is extended, but I’m not as thrilled by it as I should be. 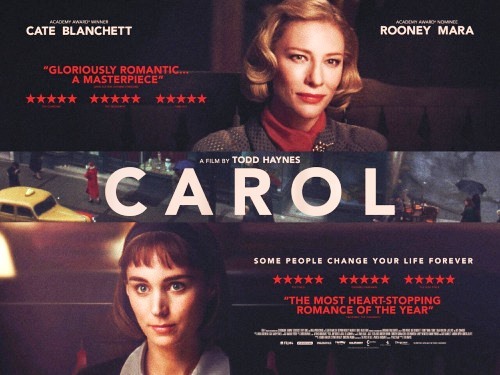 Carol is the 1950’s lesbian love story, that taboo subject, that director Todd Haynes often does very well (his last work was the HBO mini-series “Mildred Pierce” in 2011). With subtlety and understatement, Haynes’ captures the masks and disguises of East Coast culture of that time period. Cate Blanchett plays the elegant mentor Carol who lures Rooney Mara who plays the mousy shopgirl. The performances are excellent, particularly Mara’s, who never acts with bodily certainty even in broad daylight. It seems more obvious to us, the audience, than to them that they are attracted to each other. There is actually what I would call suspense, that lasts for a very long time, as to when the right moment will happen in which they will act on lust, or even in brushing flirtation. They are trapped in a society where to express desire means to first play it out in an interminable game of veiled hidden messages. That’s because if they do act on lust, at anywhere or anytime, there could be consequences. Both Carol and Therese must certainly know what they both want because to act on it could mean repercussions if they are caught. In this story, there is something doubly crucial. Carol is divorcing her husband, and if Carol is caught committing any indecent act her husband can slap a morality clause on the suit that favors him in the custody battle for their daughter. Here’s another strange thing in how times then were different. When Carol has a meeting with her lawyer, he explains to her the morality clause. There is confusion. Than he asks her if he may be blunt. I thought, finally! Somebody is going to break the wall of polite language and say what’s really on their mind in this film! What comes out of his mouth next couldn’t be anything further than blunt, it’s quite discreet. The discussion implies Carol’s lesbian indiscretions, but nothing close to clear, precise language is verbally said. There are timid but good-looking young guys throughout the film that try to woo Therese. One of them is a “serious” boyfriend who wants to marry her. He is distressed when Therese says she is going to take a road trip with this strange new friend of hers. He never uses the word “lesbian” or “gay” and says that this is some kind of a “crush.” He knows what is going on between Carol and Therese, but it’s like he can’t even admit it that Therese is gay and not the right person for him. The road trip happens, there are a series of motel stops, and well, we wait. We know there will be some kind of declaration of love at some point – we hope – but first we have to see them go through charades of indirect speech. It’s kind of a brilliant film because it is so honest in its obstinate approach. Yet it’s hard for me to work up overflowing enthusiasm for it. Haynes captures the rigid mood as well as the tactile look of the 1950’s with precision in scene after scene, but the film overall drags more than it flows. I suppose that is going to be the case when you have a film where no one ever says what’s truly on their minds. Even so, Haynes’ “Far From Heaven” (2002) relied majorly on repression and taboo love, and that was a masterpiece. The last shot of the film is of Carol, looking chic and behaving with 5th Avenue kind of debonair, absolutely doing it for appearances. I like the shot that comes right before, of Therese, who is a little too tender, a little too mannerly, and uncertain of how to come out and say what she wants to say, and say it in time. The film is adapted from an early Patricia Highsmith novel, published in 1952 under a pseudonym under the title “The Price of Salt.” Highsmith’s most accessible work were adapted into popular films, among them “Strangers on a Train” (1951), “The Talented Mr. Ripley” (1999), and the underseen gem “The Two Faces of January” (2014). Film Cousins: “Fried Green Tomatoes” (1991); “Pleasantville” (1998); “Far From Heaven” (2002); “Blue is the Warmest Color” (2013, France).